Stewart, what guides Darrell & King’s investment philosophy? First and foremost, we have a unique approach to investing. We do not limit our investment universe to the traditional investment style boxes: value, growth, large-cap, small-cap, foreign, domestic, etc. Rather, our philosophy is to invest in the areas of the market with a high probability of appreciating over a multi-year time period. We accomplish this by maintaining maximum flexibility in regard to capitalization, style and overall strategy. What is the background of your investment strategy and how did it originate? Prior to the mid-nineties, we defined ourselves as traditional value investors. After a few market cycles, we tired of underperforming the broader market when value went out of style. We decided that by taking a more flexible approach we could potentially produce superior results regardless of what investment style was in favor. Over time this approach has served our clients well. Please give us the background of your firm’s history? After a number of years in New York, Jack Darrell founded the firm in 1975 in Charlottesville, VA. He had the foresight to recognize that an independent investment management firm would provide an attractive alternative to the traditional broker model that dominated the marketplace at that time. In 1986, Charlie King joined as our director of research and Beth Morris followed suit in 1993. I joined after nearly a decade of financial industry experience in New York City and San Francisco. Being located in Charlottesville, a small college town, helps us tune out the “group think” that is omnipresent in the more traditional financial centers. We find it to be an ideal environment for engineering innovative investment strategies. Charlottesville is also conveniently located so we can serve our clients from across the country. What differentiates you from other money managers? As I mentioned previously, our approach to investing is unique and allows us to take advantage of opportunities wherever we can uncover them. By not limiting ourselves and our clients to a narrowly defined universe, we are able to find good investment prospects whatever the market environment. Secondly, we are an independent firm which allows us to focus solely on our clients and their needs. While many firms sell pre-packaged products or programs, we view every relationship individually and design portfolios accordingly. This is our 35th year in business, so we have a significant amount of experience guiding our clients through challenging and dynamic market environments. We have managed money through multiple market cycles and are comfortable operating under any market conditions. At this point, I would like to hope that there isn’t too much we haven’t already seen. Finally, we provide a very personalized service. Many of our clients are so comfortable with us that they often inadvertently forget to announce themselves when they call. It is like they are calling a family member. Fortunately, we know most of our clients by the sound of their voice. I don’t think there are too many other firms that can claim this. How many strategies do you offer and what are they? Our two primary investment strategies are the Darrell & King equity approach (referred to as Multi-Cap Equity Blend by Money Manager Review) and the Darrell & King balanced approach (referred to as Multi-Cap Balanced Blend by Money Manager Review). Our equity approach is a stock-focused strategy, while our balanced approach includes a fixed income allocation. In our equity approach, we have the flexibility to be heavily weighted toward common stocks when we think it is appropriate, but we can hold significant amounts of cash when we think it is necessary. In our balanced approach, we have the flexibility to invest in government, agency, municipal, corporate and convertible bonds, depending on where we see the most opportunity. Tell us about your equity investment methodology? Within our equity portfolios, we seek to provide superior performance over the long term while maintaining a low risk profile. The key to our equity approach is not limiting our investment universe to the traditional investment style boxes, but identifying opportunities wherever they exist. Our highly disciplined selection process begins with an in-depth analysis of the overall economic environment. Then, through rigorous industry and fundamental analysis, we search for catalysts that will contribute to earnings growth, P/E expansion and dividends, the three main drivers of any company’s return. Ultimately, if we believe these drivers have the potential to produce significant returns over a multi-year time frame, we purchase the security. Likewise, if certain factors begin to have a negative effect on these drivers or the stock becomes fully priced, we sell the security. Can you give us more detail on these return drivers? On the most basic level, investors buy stocks because they are attracted to earnings growth or dividends or believe that investors will pay a higher price for earnings (P/E expansion). Rational investors may buy a stock based on one or any combination of these drivers. Of course investors may buy stocks for other reasons too, but these are the most important as far as we are concerned. How much emphasis do you put on the current macro economic conditions and how are they related to selecting stocks? Our overall investment philosophy integrates macro trends with stock specific fundamentals. The degree to which one receives greater emphasis depends on where we are in the economic cycle and where we can identify opportunities. For instance, the identification of specific macro economic trends often leads us to favor specific sectors. Once that sector is identified, we drill down at the company level to determine which stock or group of stocks is attractive on a fundamental basis. Also, during key inflection points, such as bear market bottoms, certain sectors become so undervalued and unpopular that they offer significant potential on the upside once things begin to turn around. Macro trends play a key role in our decision making process at these times. At other times, our investment decisions are purely predicated on the specifics of individual companies. Fundamental analysis may help us uncover a unique growth opportunity relative to price or identify a special market situation based on the particulars of a certain stock. This integration of macro trends and fundamental analysis allows us to identify the most attractive opportunities at any given time. At the most basic level, we believe that careful stock selection is paramount for success. What are the characteristics of a typical equity portfolio? An equity portfolio usually contains about twenty high quality individual stocks. Our capitalization flexibility allows us to invest in small, medium and large companies, depending on where the greatest value is at any particular time in the market cycle. Price to earnings and price to book ratios have historically been below market multiples and preference is given to stocks with above average growth in both earnings and dividends. Our portfolio turnover has averaged about 20% per year. Do you only invest in US-based companies or do you also include global companies in your portfolios? There is an ongoing debate regarding the importance of a company’s location versus its sector and where it actually does business. For years the consensus was that an equity investment’s performance depended heavily on the performance of its home country. If a particular country enjoyed growth, then so did companies within that country (more or less). As economies of the world continue to merge into a true global economy, country of origin has lessened in importance and the importance of where and how a company does business has increased. Within this context, we don’t allocate a certain percentage to foreign stocks just to be in foreign stocks. For us to invest in a company it has to meet certain criteria no matter where it happens to be located. Currently, we are invested in all U.S. stocks, most with a global presence, because that is just where we are finding the best opportunities right now. How do you allocate between equities and fixed income in your balanced approach? Over time, our balanced approach has typically been about 70% stocks, 30% cash and bonds. That being said those ratios are not fixed. When we think stocks are more attractive on a relative basis, we will increase the stock allocation and decrease the bond allocation in portfolios where it is appropriate and where we have the freedom to do so. Likewise, we will decrease the stock allocation and add to the bond allocation when we feel such an adjustment is warranted. In my opinion, the world is too complex to stick to a rigid asset allocation. What is your fixed income investment philosophy? On the fixed income side, we first look closely at various macroeconomic factors. These factors include monetary policy, yield curves, foreign currencies, politics, economic activity and inflation. Using this information, we then examine current and historical yield spreads and appropriate durations given the macroeconomic environment. Finally, we scrutinize the issuer, grade and overall risk level of specific fixed income issues. Depending on risk factors, we will utilize government and/or agency obligations, as well as municipal, corporate and convertible bonds when we think it is appropriate. Ultimately our objective is to seek the optimal balance between yield and risk. Where does your research come from and how much of it is done in-house? All of our research is 100% proprietary and done in-house. We don’t utilize traditional Wall Street research or even independent third party research. Our preference is to do it all ourselves. Really good investment ideas are scarce and extremely difficult to come by. Not too long ago the challenge was getting basic data on specific securities, sectors and countries to analyze so you could use it to make investment decisions. Today, anyone with a computer has access to the same information that professionals have if they know where to look. There is so much information available through websites, blogs, subscription databases and services, not to mention the traditional media outlets. The challenge is not getting information but knowing how to interpret and use it to make solid investment decisions. This task is harder than it sounds. It requires years of study, training and good old fashion experience. There are a lot of people out there pedaling the next great investment idea, but the really good ones can’t be bought. They must be conceived of, nurtured and cared for until they bear fruit. Do you have a strategy for bear markets? Our strategy for bear markets revolves around increasing allocations to cash and/or shifting into defensive stocks. It is no secret that bear markets are inherently difficult to forecast, but we’ve been fortunate to have navigated the last two particularly well. During the late nineties, we focused on underpriced cyclical stocks and simply refused to buy into the technology fervor. When we couldn’t find investments at reasonable valuations, we just held onto large cash positions. Prior to the subprime meltdown in 2007, we moved out of our bank holdings and into defensive stocks, specifically consumer staples, which helped during the downturn that ensued. Anticipating a recovery in the spring of 2009, we shifted into economically sensitive stocks, like retail companies, which helped us outperform the major indexes significantly that year. Tell us how your firm manages risk. We attempt to avoid undue risk and feel that concentrating on long-term results is more important than participating in short-term market swings. In times of favorable risk/reward opportunities, we focus our attention on common stocks. As risk levels increase, we shift the common stock emphasis to favor cash equivalents or short-term fixed income reserves to wait for better buying opportunities. The key to building wealth over time is avoiding the big downdrafts in the market and capitalizing on opportunities. Also, we have to see the potential for a 50% to 100% return over a multi-year time frame for a stock to be included in our portfolios. This builds in a safety margin. If something unexpected happens with a particular stock, we usually still have the opportunity to make a decent return. If we instead buy a stock with the potential for a 10% return and something unexpected happens, it is pretty easy to end up with a negative return. What are the biggest challenges facing investors as they seek professional investment guidance? One of the biggest challenges is sorting through the plethora of choices that exist today. Some of these choices include hedge funds, mutual funds, financial planners, multi-family offices, wealth managers, stock brokers, trust departments, investment consultants and investment management firms. It can be difficult for the individual investor to understand the differences between all of these options. Each offers a different set of services under differing fee structures. It is imperative that investors understand these specifics and have a clear idea of what they are looking for. If they don’t there is a good chance they will make a costly error. On our website, we offer brief descriptions and things to consider regarding these choices. Just go to www.darrellandking.com and click on “Wealth Management Options.” Also, if you are reading this interview you already know that Money Manager Review is a terrific resource. Outline your investment process and what a new client might expect? During initial meetings and conversations, we take considerable effort and care in reviewing financial goals. In the event that goals are not yet solidified, we work with new clients to help ascertain and prioritize financial objectives. Next, we formulate an investment strategy based on capital market expectations to help accomplish the stated goals. Based on these expectations, in addition to a client’s personal objectives and risk tolerance, we work with them to determine an appropriate asset allocation for the portfolio. Asset allocation typically remains flexible to accommodate market dynamics and changing personal needs. Once the asset allocation framework has been established, we apply our equity approach and/or our fixed income approach to select individual investments. Once individual securities have been chosen, we implement the appropriate strategy. Clients receive quarterly updates from us as well as trade confirmations and monthly statements from their custodian. We also encourage clients to call or schedule an appointment with us whenever questions arise. Institutional clients typically have clearly defined investment objectives that are spelled out in an investment policy statement. We take great care to integrate the specific objectives of our institutional clients into our investment process, as previously detailed. How does your investment team make decisions and what are their backgrounds? All of our portfolios are managed by our investment committee, which consists of myself, Jack Darrell and Charlie King. We meet regularly to discuss portfolio specifics and the global securities markets. We have gone to great lengths to put together an experienced, professional team of individuals who uniquely complement one another. This allows us to provide an uncommon level of investment management expertise to our clients. Jack is a graduate of the University of Virginia and started his career in finance in New York as a registered representative. After leaving New York, he moved to Charlottesville and founded the firm in 1975. Charlie graduated from Wake Forest and earned his M.B.A. from the University of North Carolina at Chapel Hill. At 29 years old he became Director of Research for Wachovia and was the youngest person to have held that position up to that time. After graduating from Duke University, I worked in investment banking and investment management in New York and San Francisco before joining Darrell & King. All three of us are CFA charterholders. Beth Morris is also a UVA graduate. She is integral to our team and handles everything from trading and reporting to office management. Are most of your clients local or do you handle accounts from all over the country? We are fortunate to have a truly wonderful group of clients. They make coming into the office a pleasure. Many live here in the community, but we have clients from all over the country. Clients come to us through word of mouth so, as you can imagine, we have pockets of them in many different states and a few different countries. 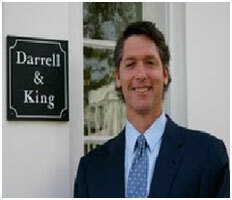 How can readers keep up to date with Darrell & King Investment Counsel? We write quarterly market commentaries that are available by email. If readers send me the name and email address, I will put them on our distribution list. My email address is sdarrell@darrellandking.com. Another good source of information is our website, www.darrellandking.com. There you can view our latest interviews and news articles, along with other pertinent info. The goal is to make this an informational hub that clients and interested parties can reference.